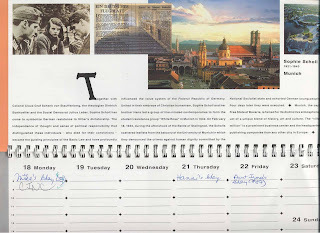 In July 1994, I was working away at my translation business when I stopped to really look at the week's photography of the German American Chamber of Commerce calendar. The photograph of Munich caught my eye first. That's the way the city looks when Foehn blows in, that southern, Italian wind that clears out cobwebs and lets you see the Alps from the city. A picture this clear can probably be taken only once every ten years. But then, who were these people in the old snapshot? I had never heard of them before. "Must be Communists," I thought. Then the air conditioning went out, and a horrid landlord would not fix it for nearly a week. He drove me straight into the arms of the Houston Public Library. I cried when I read those first few books by Hanser and Dumbach/Newborn. Spent a lot of time reading extant literature (all secondary sources), moved beyond words by a story of genuine martyrdom and sacrifice. I wrote the first draft of my nonfiction novel and decided I simply had to go to Germany to tie up the loose ends. Sold my translation company in January 1995, and convinced my mom to travel with me as videographer, then headed out, thinking I would only need the three months we had scheduled to wrap it all up and get this thing out the door to a publisher. The Forsters had agreed to let us have their Ferienwohnung near Bad Toelz for the Munich portion of our stay, and they provided far more than that. They showed up with warm winter clothes, including wool coats, and maps. Early March 1995, after attending the annual memorial service at the University of Munich on February 22, I received a letter from Inge Aicher-Scholl that I thought had surely ended my White Rose research. Her letter was essentially a Schreibverbot, in which she stated that she had written the only book that ever needed to be written about the White Rose, and that she was henceforth forbidding her publisher (S. Fischer Verlag), her agent, and her son (who had taken over the Scholl Archives) from speaking to me. I still do not know what I ever did to deserve such a letter before she had ever exchanged a single word with me. I had only written her, asking for an interview, and she had granted dozens of interviews before. Being the honest, direct person that I am, I notified each subsequent person of Inge's letter. Instead of doors slamming in my face, they miraculously opened. People talked who had been silent before, and people who had talked said things they had suppressed for many years. For it turns out that the White Rose story has been controlled by Inge for half a century. At the expense of the truth, and the friendships that made their resistance possible. The truth is sometimes uglier than the legend that has grown up around the resistance movement. Haloes came crashing to the ground, as weaknesses were exposed and the thirty or so among these friends were shown to be regular people like the rest of us. The generic term of "Christian humanists" that this calendar chose is woefully inaccurate. Some were devout Christians, pained by the way their churches had deserted them. Others were not Christian at all, following anthroposophism or secular humanism as their guiding principles. Some became more religious, others less, as 1933 faded into 1943. Some, specifically Hans Scholl, demonstrated gross negligence and irresponsibility in their behavior, causing more harm to be inflicted on the friends than was necessary. And others, like Susanne Hirzel, overcame fear of being caught, doing some small thing or another that contributed to the whole. The true story, the whole story, still makes me cry. But it also makes me angry, makes me laugh, makes me question, makes me want to sing and rage at the same time. If my readers do the same in at least half the measure as I, then I will have succeeded.